Leeds United head coach Uwe Rosler said the addition of another midfielder to his squad was crucial after revealing that Luke Murphy would miss the start of the new season through injury. Murphy will be absent for up to seven weeks following a minor knee operation and the loss of the 25-year-old ahead of Leeds’ first summer friendly has intensified Rosler’s search for players in his position. United’s boss expects Murphy to sit out all five of United’s pre-season fixtures and admitted that he had little prospect of recovering in time for the opening match of the Championship season at home to Burnley on August 8. Rosler has other central midfielders available to him, including youngsters Alex Mowatt and Lewis Cook and Italian Tommaso Bianchi, but Leeds opted to release Jamaican international Rodolph Austin at the end of last season. Murphy suffered his injury during a training seassion last week – an incident which Rosler described as “unlucky” – and he was sent for surgery promptly by Leeds after seeing a specialist. “He twisted his knee without anyone around him,” Rosler said. “It was a very unlucky situation and the last minute of the training session. “He’s already gone for a small procedure on his knee. I don’t think we’ll have him back ready to play in the first game against Burnley. We’ll be thinking between four and seven weeks. Murphy - a £1million signing from Crewe Alexandra in 2013 - enjoyed an impressive resurgence in the second half of last season having drifted towards the exit door at Leeds before Christmas. The midfielder was out of favour for large parts of the term but regained his place in January and contributed to a successful fight against relegation from the Championship. Rosler said: “I’m sad for Luke because he really tried to impress and he finished last season strong. 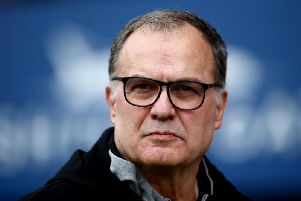 Four new players have come to Leeds since Rosler replaced Neil Redfearn as head coach in May and a holding midfielder and a winger remain his key targets, along with a second-choice goalkeeper. Former Newcastle United keeper Jak Alnwick has moved on from Leeds after a short and unsuccessful trial but ex-Manchester City player Adam Drury - a 21-year-old who can play as a right-back or on the wing - is continuing to train with Rosler’s squad. Drury could feature at Harrogate Town tomorrow and is also likely to be involved in next Wednesday’s friendly at York City. Rosler indicated that a decision on the youngster’s future would be taken before Leeds fly to Austria for a pre-season training camp on July 18. “He’s still here,” Rosler said. “I’ve spoken with him and we’ll have another talk at the end of next week before we go to Austria. Then we can give him a clearer indication. Rosler confirmed that he expected more movement “in and out” of Leeds but said: “It’s very important that when I say what I’d like, I don’t want to put any pressure on our football club. Have you downloaded our free YEP football app available on Android and iphone?